With two days of fishing left we divided into two groups in order to drift to waters we’ve been on previously and to prospect new areas. 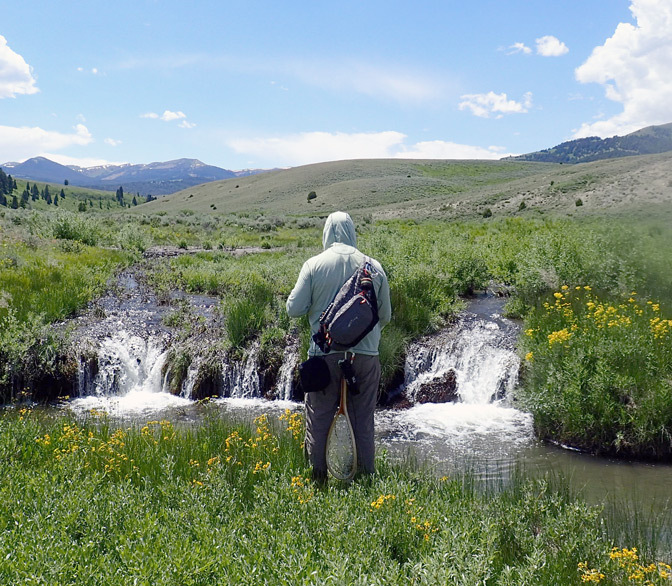 On Wednesday, Matt and I accompanied Frank to a section of the Lower Ruby, far below the dam near Alder, the nearest town to Upper Canyon Outfitters. Todd and Nick went the opposite direction, to the Upper Ruby, in search of wild and remote locations. We all caught fish but not with the frequency we had been experiencing. As the day progressed, the skies darkened and a massive thunderstorm rolled in across the Gravelly Range. It chased us from the river early and we figured the incoming low pressure system put the fish down. Matt hits a deep pool while forging new ground on the west fork of the Upper Ruby. On Thursday we switched. Todd, Nick and Frank headed back to the Alder area while Matt and I explored the valley. The results were much better. Matt and I first hit a narrow stretch of the Ruby 15 miles and an hour upriver from UCO. It was a section that oxbowed through a high-mountain meadow where sweet-smelling sagebrush and willows held the banks tight. We had bear spray at the ready after hearing of increasing grizzly activity in the area over the previous few weeks. 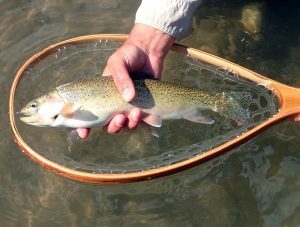 We leapfrogged from pool to pool fooling six-inch cutthroats on big stimulator patterns a third of their size as well as tiny nymphs. It was much like the wild brook trout fishing we do in Pennsylvania’s north woods. After a few hours we moved a bit down river to the confluence of the Ruby and its west and east forks. Nearby is a seasonal cow camp used during the summer’s cattle roundup. None of the Drifters had ever explored the west fork, so Matt and I forged new ground for the early part of the afternoon. Action was frequent and similar to what we had experienced in the morning. With just a couple of hours remaining before we had to be back for dinner at the ranch, we deliberated our options to close out the week. I landed upon a nice stretch of the Ruby I had fished with Frank during my first trip and it was halfway back to UCO. The timing couldn’t have been better as Matt quickly pulled in seven trout, a mix of rainbows and cutthroats, along with a few whitefish. That success continued as we covered as much water as possible before our day ended. I spotted a nice, deep run against the far bank of an oxbow. A silverish flash followed my trailing fly on the first cast. For some reason this caught me off guard and I wasn’t ready for the subtle bump it made at its perceived quarry. On alert, I made several more casts before Matt came over and we decided to start making our back to the truck. Another silver flash zipped in for a vicious strike. My 9-foot, 4-weight fly rod bounced in exerted energy. The fish fought mightily before coming to net and I was astounded by the stunning cutthroat within its frame. Of the dozens and dozens of fish I caught over the past week, from the 20-plus inch rainbows and browns, to the ridiculous number of 14-18-inchers of the same, to the delicate Upper Ruby cutthroats, and even my very first grayling, this will be the one I most remember. Perhaps that’s because it was my final fish from the final cast of the trip. But that 14 inches of thick, speckle-sided, rosy-cheeked and orange-throated specimen of darting fervor is ingrained in my memory. The way it slashed through its dark green home pool in search of refuge. The way it grappled with my line until finally succumbing. That pure strain, Westslope cut. That is what I will recall. Best yet, it was caught in a national forest, with public access. Anyone else could have caught the same fish. But it was me. And next year I will visit his home waters and do my best to entice him once again.